In the last post, I’ve talked about adding metrics to the Haskell application. Unfortunately, that post didn’t have a full code example and had only minor pieces of the code. So it could be hard to write your own application based on that post. So I decided to prepare a full example that can be looked at and reused in later posts and projects. You can find the source code on GitHub. The app is a very simple skeleton of so if you have experience with writing those, feel free to skip this post. I’ll take a famous benchmark as a site specification. 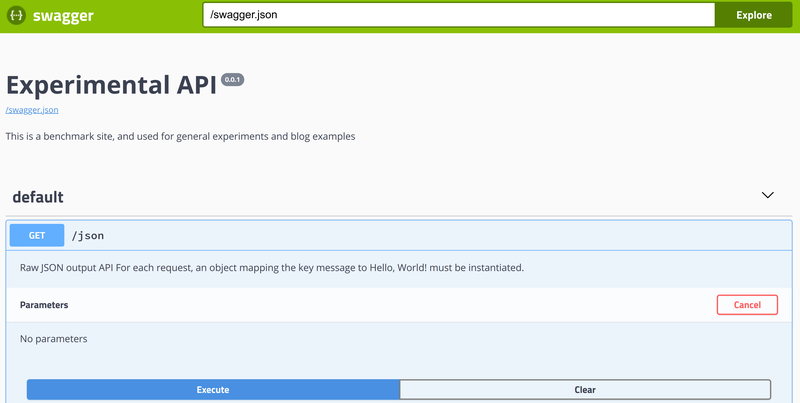 The API is simple enough to represent exciting features and doesn’t take much time to write. I’m not going to compete against the other implementations of that benchmark (at least I think so at the time of writing this post). Today I’m going to make a skeleton of the site and one endpoint only. I’ll take servant as a web framework, in my taste this is the best framework you can use unless you have exceptional needs. The main features of the servant framework are that it allows to generate and test much code for free, without much extra cost. Servant framework has a very nice tutorial and documentation that can be found at reads-the-doc site . \ to \"Hello, World!\" must be instantiated." I prefer to keep a type synonym for each endpoint (or endpoint structure) as that would allow using that type in the other parts of the program for code generation. This type explains how a handler does work, and each :> splits the type into URL pieces. This type tells that application can handle Get requests on the URL /json if accept type is application/json and returns a Message. & info.title .~ "Experimental API"
\ experiments and blog examples." Then we can run the server. Ours sever consists of the swagger UI and our application. server = pure $ Message "Hello World!" And all that comes for free. Naming conventions - it worth defining common conventions for converting Haskell data types into the JSON representation and use them across the project. 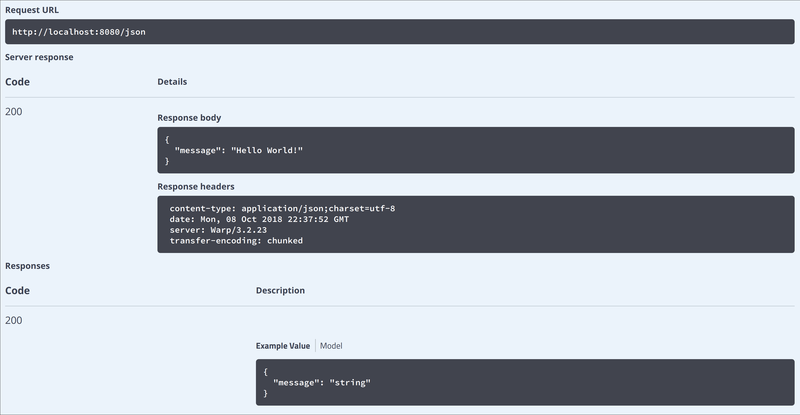 Encoding tests with servant and swagger you can automatically test serialisation of values of all the types used in the API. Also tests check that specification is up to date. Now we have a simple site with helper interface and specification. There are many missing pieces, for example: a. configuration parsing; b. logging; c. more autogenerated tests; d. nice defaults for the RTS options. All of them will be covered in the following posts. In order to build everything I prefer to use nix package manager. Both stack and cabal-install are nice tool to do that, but with nix you can add more features to the build system. For example building of the docker containers, building packages written in other languages, and setting up development environment. Build scripts for package can be found at overlays.nix. Build scripts for docker container are in docker.nix. At this point we are ready to setup our environment with Grafana and Prometheus. Configs are the same as the one described earlier, or they can be found on GitHub. main screen lists all instances with Haskell applications to filter on. If specific instance is chosen then all following plots shows information for that instance only. shows rate of CPU seconds spent by the program. Basically it’s how many secods the program worked in 1s. You can realize how active your application was. Mutator CPU time shows how much CPU time you’ve spent doing the actual work. If total CPU time is much higher than Mutator CPU time, the you are likely to have problems with GC. shows the rates of the allocations and copying data during GC. This panel is for general information, because it’s not easier to use other controller to get information about memory usage of the given instance. data that shows the GC information that is provided by the runtime system. It provides total number of GC and major GC and their rate. Proportion of time spent in GC to the total running time, if this question grows higher then 0.1 this means that you are spending one tens of the time in GC, and that is not good. Proportion of the time that capabilities spent synchronising to the time they did actual work, if this value grows high, then you have problems. In addition the structure of the heap is explained, and we plot how many values of the different type (from GC perspective) we have. Config itself can be taken from GitHub. Unfortunately GC information tells us information about the last GC only so everything that had happened between scribe intervals will be missing from our data. In the next post I’m going to run some benchmarks on the application (and potentially introduce other endpoints) and discuss if missing information is actually a problem and what can be done.